Requires extra power and bandwidth. memory a sequence (typically 62 bits long). As time goes on, additional bits aie received and stored. These sequences are compared -with coded sequences which could have been transmitted. The possible sequence which most closely resembles the received sequence is chosen as the most likely sequence transmitted. This process is repeated a number of times to reduce the probability of error. As shown in Fig. 13-9, Viterbi decoding gready reduces the £yW0 required to obtain a specified BER. For example, a BER of 10~5 is achieved with an Eb/N0 of 4.4 dB. This represents an improvement, or coding gain, of 5.2 dB below the 9.6 dB required for uncoded BPSK. where CIN is the average carrier-to-noise power ratio in the channel (see Panter , Sec. 19.2; or Sklar , Sec. 7.4). We cannot reach the Shannon limit in practice because the transmission bandwidth and coding complexity increases without bound. But we can approach this limit by using a double, or concatenated, coding scheme. 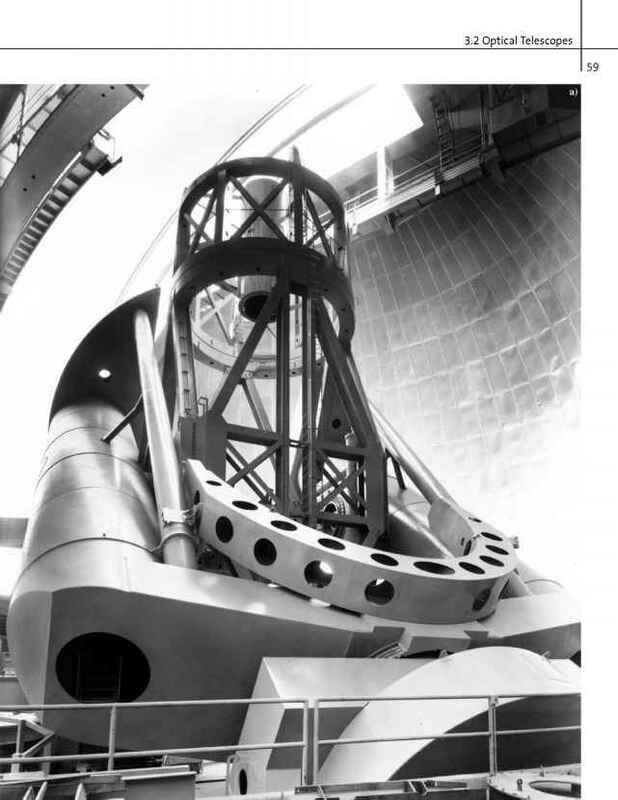 The Pioneer deep-space communication link uses this technique to obtain the performance required to overcome die large space loss [Yuen, 1983, Sec. 5.4.4]. The binary signal is first block encoded using a 255-bit Reed-Solomon code with 32 parity bits. The block-encoded signal is then encoded using the rate-1/2 convolution^ code. The data is recovered at the receiver with a Viterbi decoder followed by a Reed-Solomon decoder. As shown in Fig. 13-9, the BER performance for the concatenated code is only 4.2 dB above the Shannon limit at a BER of 10~5. Longer and more complex codes can be used to push performance even closer to the Shannon limit This technique is not presendy used for data rates much above 100 bps due to the complexity and cost of the decoding process. However, we expect this limitation to disappear in the future with the development of high-speed, low-cost digital processing circuits. Figure 13-9 demonstrates that the BER is sensitive to the Eb/N0 level. At error rates below 10*4, a decrease of 1 dB in Eb/N0 will increase the BER about one order of magnitude. Thus, providing adequate link margin in our design (discussed later) is very important. Note that the Eb/N0 values given are theoretical, based on infinite bandwidth transmission channels and ideal receivers. In practice, we must account for band-limiting effects, deviations from ideal filter responses, phase noise and frequency drift in local oscillators, noise in carrier tracking loops, and bit synchronizing errors. Thus, we must add 1 or 2 dB to the theoretical Eb/N0 to allow for these losses. Table 13-11 showed that to obtain a low value of EbfNa for a BER of 10~s, we must be less efficient in using the spectrum, which means the transmission bandwidth must increase. This is the result of adding forward error correction check bits to the signal before modulation, thus increasing the transmission rate through the channel. However, recent techniques can achieve significant coding gains without increasing the bandwidth [Ungerboeck, 1982; Sklar, 1988, Sec. 7.10.6]. The basic idea is to combine the coding and modulation process to generate a set of possible coded signal patterns at RF, each pattern corresponding to an n-bit word. The receiver knows the set of possible patterns and chooses the pattern that most closely resembles what it receives. For example, a four-state, rate-2/3, encoder combined with 8PSK modulation achieves a 3 dB coding gain over uncoded QPSK modulation with the same bandwidth. (8PSK is like QPSK except the carrier phase is set at one of 8 possible phases separated by 45-deg intervals.) Such schemes have been proposed for high-speed data communication on satellite channels and are likely to be used in future space systems [Deng and Costello, 1989]. The transmission path loss caused by the Earth's atmosphere, La, is a function of frequency as shown in Fig. 13-10. This figure gives the attenuation at 90-deg elevation, that is, zenith. To determine the loss at elevation angles, fi, above 5 deg, divide the zenith attenuation by sin fi. At frequencies below 1,000 MHz, ionospheric scintillation can cause significant fluctuations in received amplitude and phase. These effects are most severe at frequencies below 200 MHz during periods of high sunspot activity, when they can disrupt communications (see Ippolito , Chap. 8). Above 50 GHz, high attenuation occurs at frequencies corresponding to the oxygen absorption band. Virtually all Earth-space communications use frequencies between these two extremes, though some projects have considered the 90-GHz band. 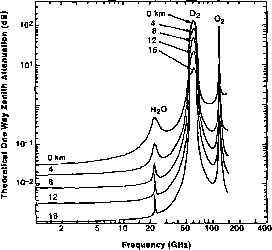 Of special note is the high absorption band of oxygen at 60 GHz. Intersatellite links often operate at 60 GHz, using the atmosphere to shield from interference or jamming originating on the Earth's surface. Fig. 13-10. Theoretical Vertical One-way Attenuation from Specified Height to the Top of the Atmosphere. Plot assumes 7.5 g/m3 of water vapor at the surface, and does not include effect of rain or cloud attenuation [NASA, 1983]. Figure 13-11 shows that clouds and rain attenuation also add to losses, increasing with frequency, in the transmission path. This figure comes from the Crane model—a set of tables and equations based on observed climatic data used to estimate the rain attenuation (see Crane , or Ippolito ). This attenuation becomes an important consideration when designing systems employing satellite-Earth link frequencies above 10 GHz. Figure 13-11 also shows that the attenuation increases rapidly as the antenna elevation angle decreases below 20 deg. When operating at frequencies above 20 GHz, the minimum elevation angle to the satellite should be specified at 20 deg, especially in high rainfall areas. Note, however, that increasing the minimum elevation angle dramatically reduces the size of the satellite's coverage area (see Sees. 5.3 and 5.4). where La is the rain attenuation given as a power ratio, and Ta is the temperature of the rain, usually assumed to be 290 K. The significance of this noise increase depends on the system noise in clear weather. For example, if a receiving system with a normal system temperature of727 K experienced 10 dB rain attenuation, its noise temperature would increase to 988 K, increasing N0 by 1.3 dB. The decrease in C/N0 would then be the sum of the rain attenuation (-10 dB) and the increased noise (-1.3 dB) totaling 11.3 dB. World Administrative Radio Conference (WARQ. They are administered in the United States by the Federal Communications Commission (FCC) for commercial users, and by the Interdepartmental Radio Advisory Committee for military users. The system designer must apply for and receive permission from the appropriate agency to operate at a specified frequency with the specified orbit and ground locations. This is often a time-consuming procedure (see Chap. 21.1). For an excellent summary of this complex subject, see Morgan and Gordon . TABLE 13-12. Limitations on the Frequency Bands and Flux Densities Established by the rTU. 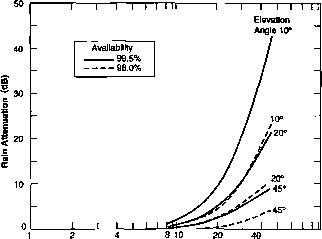 Power density limits are lor elevation angle >25 deg. They are about 10 dB less for lower angles.